Movistar's Alejandro Valverde has taken his tenth stage victory at the Vuelta a España. The Spaniard was the strongest at the first uphill finish of the 73rd edition of the race. 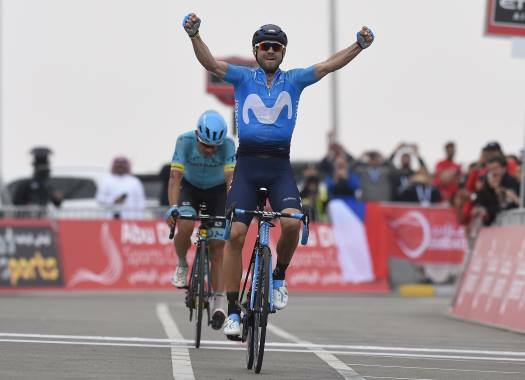 It all came to the last metres when Valverde and Michal Kwiatkowski (Sky) attacked from the peloton to catch Quick-Step Floors' Laurens De Plus. The Spaniard launched a last-metres attack and was the first to cross the finish line in Caminito del Rey. "For the Vuelta, I have trained in a regular way and at the end, the shape of the Tour has shown now," said the rider at the end of the stage. "I'm very happy because I've been a while without getting a victory and even more winning a stage here at the Vuelta makes me very happy. "I started my attack very well. I calculated the distance and started at around 500 metres from the end. I saw that Kwiato was coming, so I let him pass when we got to De Plus and in the last curve I overtook him." Valverde doesn't worry about his immediate future and now he just wants to enjoy this moment. "For the moment, I have already reached one of my objectives that was to win a stage and I will go day by day. We have started very well and now we will go step by step."